The new Marvel’s film, Captain Marvel, will open with a tribute to Stan Lee. Together with Jack Kirby he created almost all the Marvel comics. Kirby was the only one that served as infantryman on the battlefields in Europe. In 1943 Kirby was drafted into the United States Army (Service Number: 32966619). He followed his basic training and joined F Company of the 11th Infantry Regiment, 5th Infantry Division in Europe in their drive through France. In September 1944 the men of the division received the mission to take the fortified town of Metz. This proved to be the deadliest task of the Division throughout the war and Kirby witnessed it all by himself. From September 8 to 10, the 11th his regiment made a crossing over the Moselle River at the village of Dornot to the village of Corny. Unexpected, the Germans had set a trap for them. Kirby found himself on hell on earth. The men who made it across the Moselle were trapped in a patch of woods named after its shape: The Horseshoe Woods. Somewhere between the 8th and 14th of November, Kirby was wounded by bullet in his shoulderblade. He was treated at the battalion’s aid station to continue the fight. However, it was a cold month and the Moselle river was flooding. On November 14, Kirby was taken off the line with trench foot. It wasn’t until July ’45 that he was discharged from the hospital. on the location where Kirby once fought. True Marvel fans might’ve recognized the war’s influence on Kirby’s work. However, for the rest of the people this information will give new understanding to the works of Captain America, Hulk and many other well known Marvel characters that were created by Kirby. One of the most overlooked units in World War II is the Graves Registration Service. The men assigned to this unit were responsible for processing the bodies of killed US enlisted men as they were transferred to their final resting place. As Footsteps Researchers, we come across very interesting and sad documents when we image the Individual Deceased Personnel Files (IDPFs) for clients. Many times, we hold handwritten and heartfelt letters from mothers, fathers, wives, and others; begging for answers as to where their loved one’s belongings were or dealing with the burial of their soldier’s body. Quartermaster, Graves Registration Company during World War II. Its first press was the only one ever printed making the book very hard to get. However, in 2016 a limited edition print run was done and the book is available again. This is a fantastic read as it describes the service and jobs men had to endure in less than pleasant environments. 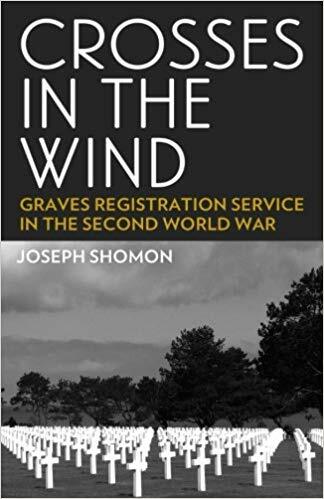 The personal account of Joseph Shomon takes you from Bastogne to Berlin and gives you insight into the birth of the American War Cemetery in Margraten. It’s not a personal story of war, but a tale of the consequences of war. The job done by men like Shomon was a necessary one, allowing every enlisted man to rest in peace. We are proud to assist families and those interested in the burial records that are housed at NARA St. Louis. Our Footsteps archive researchers submit the forms in person and image every page with great care. We owe a great deal to the men who served in the Graves Registration Service and thank them all for their service, commitment, and honorable dedication to our fallen warriors. Graves Registration Form for an official burial of a WWII soldier. On December 30, 2018, Joey van Meesen and Myra Miller took off on a day trip through Belgium and Luxembourg (with Ronald van Meesen singing in the back seat). The goal was to locate current locations to match original WW2 photos. Then Joey used his skills to blend the shots together. We had so much fun that day! #footstepsresearchers @footstepsresearchers. Then & Now: Infantrymen of the 83rd Infantry Division march into Bovigny, Belgium, after driving east from Bois de Bonce Forest. Co. Bo, 329th Regt. US First Army. 20 January 1945. Signal Corps Photo. ETO-HQ-45-9096 (Tec 4 Leo Moran) from 165 Sig Photo Co. Released by Field Press Censor 22 January 1945. Then & Now: Tank destroyer moves with the infantry through the town of Bovigny, Belgium. The column in the foreground is World War I Memorial. 329th Regiment, 1st Battalion, 83rd Infantry Division. 639th Tank Destroyer Battalion. 20 Jan 1945. Signal Corps Photo HQ-45-9099 (Moran). Released by Field Press Censor 22 Jan 1945. Then & Now: This photograph shows members from the 137th Infantry Regiment of the 35th Division standing near a war-torn building in Tintange, Belgium. We hope we will be back to the Archives soon to finish our projects for clients! However, Sgt. Garrison did leave something behind, his voice. While deployed to the staging field at Herington Army Airfield in Herington, Kansas, Sgt. Garrison waited with his crew members for their departure on overseas assignments. During one of these waiting periods and prior to taking off for the Pacific Theater, Garrison encountered a mobile recording studio on base who recorded messages to loved ones from soldiers. He sat down and spoke into the microphone to record side “A” which opens with a greeting, “From Herington Army Airfield, we have the voice of Earl Garrison…” and then continues with a message from Earl to his mother and father. Garrison assures them he is fine and will see them soon. The flip side of the record “B” is to Irene, his wife. He tells her she has made him “the happiest man in the world” and will be home soon. Unfortunately, Sgt. Garrison did not make it home. Fast forward to the year 2010 when a “disco” record was given to Jerry and Jill Adlon (St. Louis, Missouri) in a box of other records from his mother. The story his mother had received the record from her mother. Jill listened to the record in 2013 and realized it wasn’t a disco record and made a an effort to try to find Garrison’s family with little success. Then in 2014, their house was destroyed by fire. Several items were saved, including the antique hifi, and stored until they rebuilt in 2016. When the hifi was moved into their new home, Jill realized that the record with Garrison’s voice was still on the turntable, undamaged by the fire. 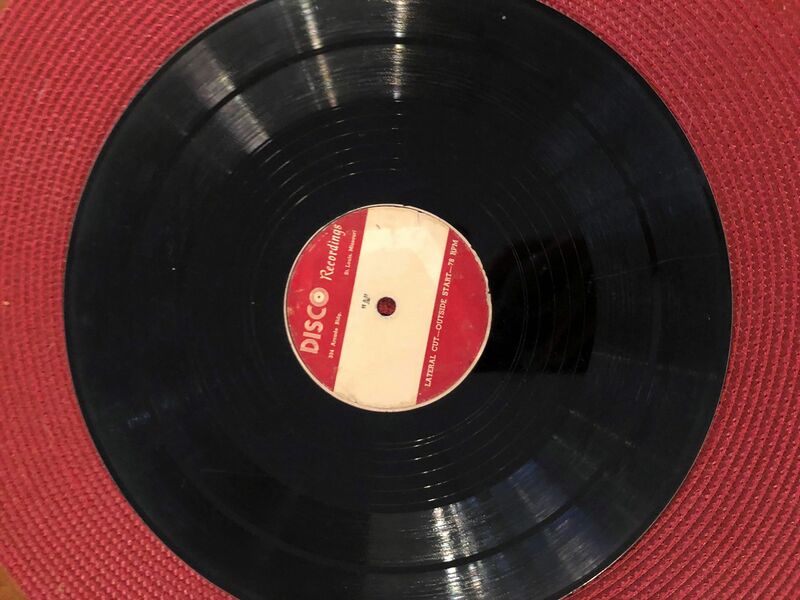 Then in May 2018, Sara Collins, a friend of the family and a member of Footsteps Researchers, was at the Adlon’s home and listened to the record. At the first sounds of Garrison’s voice, she said her jaw dropped and knew that her team of WWII researchers should find his family. Through the nonprofit arm of the research group named LEGACY: Lost and Found, Sara found the family of Garrison in San Francisco. What was the connection with Earl W. Garrison and how did the record end up in the Midwest? Further research by the group found that Irene Garrison moved to St. Louis after her husband’s untimely death. She remarried and worked as a nurse. It remains a mystery how the Adlon’s relatives ended up with the record in the first place. The voice of Earl W. Garrison returns to his family 73 years later. 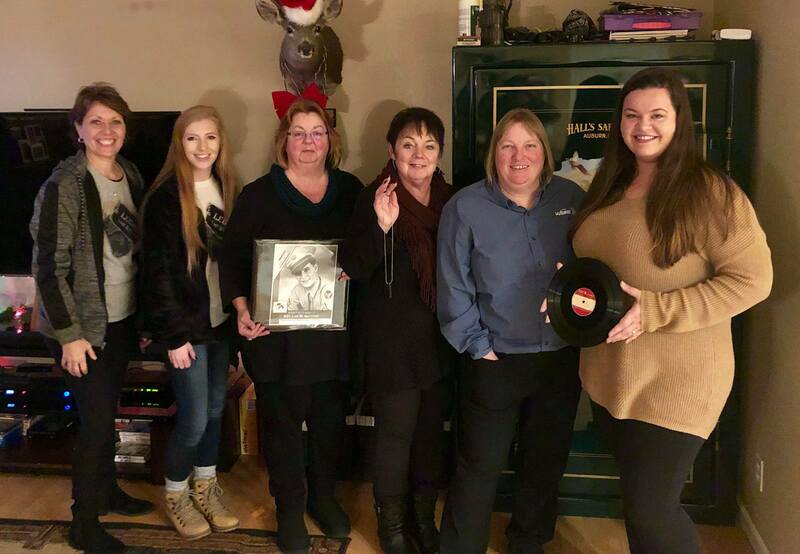 Two members of Footsteps Researchers, Myra Miller and Sara Collins, are flying from Missouri to present the record to Earl W. Garrison’s family on Wednesday, December 5th, at 6:30 pm in Petaluma, California at a private residence. Nieces and nephews will be present to receive the record and information about Sgt. Earl W. Garrison’s WWII service. The family has secured a record player so as to play the recording immediately upon return. The media is welcome to interview the family members and researchers after the presentation. Media must contact Myra Miller in order to acquire directions to the address. Myra Miller, PhD, (St. Louis, Missouri) and Sara Collins (Berryton, Kansas) are two members of the research group who worked on the return of the record. 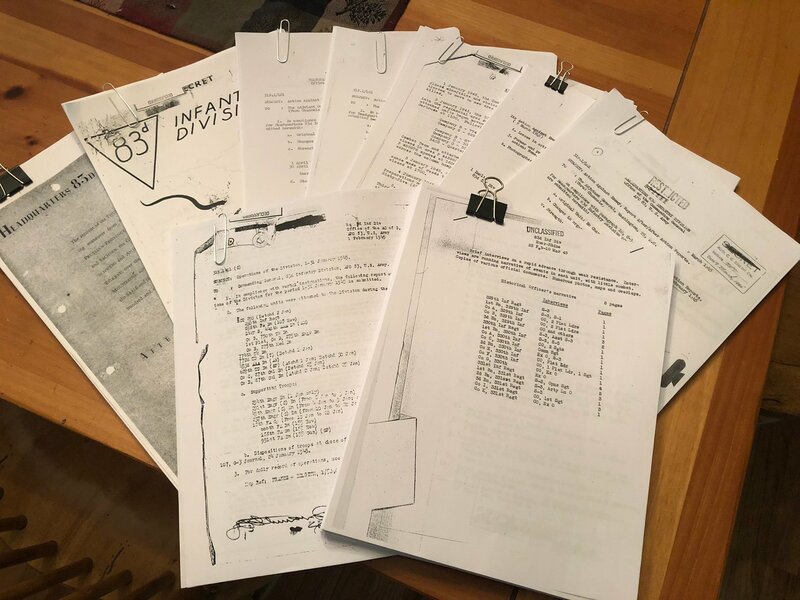 The group is typically paid to find records and reports from the National Records and Personnel Center in St. Louis in addition to creating Footsteps Research Packages and leading WWII Battlefield Tours in Europe. However, they do provide a nonprofit service called LEGACY: Lost and Found. They offer their expertise for free to help those who might have a relic from WWII with a name or initials scratched on it and try to help return the item to the rightful owners. More information can be found at www.footstepsresearchers.com. Prepare to be amazed! 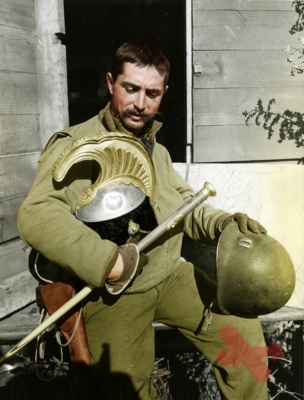 Check out the spectacular photographic colorization by Footsteps Researchers team member, Loïc Jankowiak. He is also a graphic designer when he isn’t working on WWII research! Click on the photos and see them transform before your eyes from black/white to color! You can contact Loïc at loic@footstepsresearchers.com if you are interested in having him colorize photos. Our military artist, Ken Miller, can take any photograph and draw a portrait/landscape in graphite or watercolor! His email is kenmiller2858@yahoo.com it you would like to consult with him on a project. Frame one of his professional drawings and they make a unique and memorable gift. See examples below the photos. Wreaths Across America in Normandy! Wreaths Across American In Normandy is offering an opportunity to tell your Veteran’s Normandy story including a photo of your veteran. If selected, you could win a free trip to assist in the laying the Christmas wreaths at Collevile Sur Mer in Normandy. Myra submitted her father’s name… you can, too! MEET Footsteps Researcher – Loïc Jankowiak! My name is Loïc Jankowiak, I am 25 years old and a graphic designer living in Bandol, France. Please see my website at ljankowiak.fr. I think I became a designer, so that I could blend my passion for history with creation to have the ‘power’ (insert laugh) to share to the media as I want. I am not like others who say they became interested in history since they were very young. I started to be fascinated and discover the major event of WWII when I was 12-years-old. I have always been a very curious kid and now as an adult, this interest leads me to continue my quest for WWII knowledge. Since the first commemorations of the landing of Provence in 2009, in which I participated as a reenactor, I really began to take an interest in what was called “Airborne in Provence”. This also led me to study the liberation of the area by the American troops. Since I lived in Provence, I quickly tightened the vice on what I should be interested in as a WWII specialty. I concentrated on the short existence of the First Airborne Task Force (the provisional airborne division for Operation Dragoon) and this has been the center of my research for a few years now. With the existence of the 1st Airborne Task Force being a relatively short time, I also became interested in the long history of the units which constituted the 1st Airborne from their beginning to the end. To make a long story short, I am especially interested by the US Airborne, Special Forces, Independent units which fought in the Mediterranean Theater of Operation, and beyond. My area of specialty involves the war regions of Southern France, Italy, and Northern Africa. My curiosity led me to interest in little or unknown units of WWII. These units have limited essential information. So, for me, every single word and document is important so that I know more! It is hard to explain… I am interested in all the possible stories of each of these units. I search constantly for details, components, functions, staff, and most importantly, the men themselves. At the beginning of my research, I wanted to contact veterans through the internet and by mail. At first, I received no answer, but this did not discourage me. A few years later I received a reply from Mike Reuter and John Devanie, both 509th Parachute Infantry Regiment. Since then, I have probably interviewed over seventy veterans through internet and by phone who told me “their war.” Some veterans who remained in the shadows for over 65 years were surprised to finally get recognition. The internet has appeared to me as a rich interface to learn, transmit, and share. That is why I had the idea in 2013 to create a website to share what I learned in the fighting areas and books, but above all, to pay tribute to paratrooper veterans of the “Forgotten D-Day.” It was from that year that I started to put online the first pages of the site. It was in March 2013 that the site ‘First Airborne Task Force: the Forgotten Paratroopers’ was launched. www.1stabtf.com. I found Myra Miller on Facebook and through a twist of fate… I ran into her in Auxais, France when my WWII reenactment group was on march ending at the Church d’Auxais. We recognized each other and had our photograph made. Then, she searched for me in the fields of our WWII reenactment group’s bivouac area in order to personally hand me a copy of Soldiers’ Stories: A Collection of WWII Memoirs. Earlier this year, she contacted and invited me to join the Footsteps Researchers team as a researcher and tour guide. I have been assigned to assist on Footsteps Researchers Packages and write Day-by-Day narratives in addition to developing Google Maps footsteps using the Morning Reports she images from the archives in St. Louis. I have never seen anything as remarkable as these footsteps maps and I am honored to be part of this unique team helping descendants find their veteran’s exact steps across Europe. I was also asked to help develop the logo for LEGACY: Lost & Found, the non-profit arm of Footsteps Researchers. We help return WWII relics to the families of the men who lost them. It is quite an experience to be part of this operation! Our Footsteps Researchers team is made up of many outstanding people from around the world with skills and talents. I am proud to work with Joey van Meesen, Florent Plana, Bob Konings, and Benjamin Mack-Jackson as a younger generation of people interested in preserving the history of WWII. www.footstepsresearchers.com/our-team. We are happy to announce that we are now able to get WWII Unit Journals, After Action Reports, photographs, and maps much faster from the NARA facility in College Park, Maryland. In the past, we had to request them through another Independent for Hire Researcher which added to the cost and slowed down the process for our client. Now, we have our own Footsteps Researcher on the east coast with extensive archival research, specifically WWII. We have researchers at both facilities where the most important documents for WWII are housed. For any request regarding research, it helps to fill out the form on this site under the Contact Us tab. The request comes straight to our email box where we can then process into our project list.